Remember the old flip phones? Of course you do, they were huge and ugly and half of them wouldn’t fit in a pocket even when folded up, but oh were they cutting edge in 1998. Soon you’ll be able to have that same terrible user experience with the iPhone. 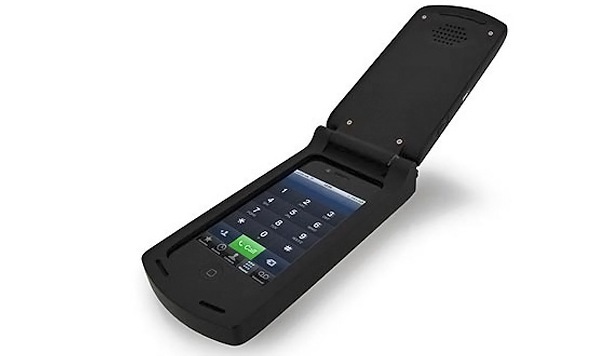 From the company who brought you the ridiculous 80’s block iPhone case comes a late 1990’s early 2000’s giant flip-phone case for the iPhone. It’s both hideous and hilarious, and it will certainly be popular in that laughably retro stupid way. Unfortunately it’s not available quite yet, we’ll all have to wait until later in the year to grab the flip case for about $24, so put it on your Christmas list. Heads up to Gimzodo for the find. Hipsters are moving to the 90’s nostalgia. Next up will be Blackberry cases for the iPhone. And what about a case like this one? Crap …. why someone want to do this? You need to have a bigggg head to use that thing imagine distance from mouth to ear ???? ?